The ultimate wedding planner for your pocket. Get access to Australia’s number one wedding planning directory already used by 80% of Australian couples. With our app, you can find and contact your favourite wedding suppliers directly, check off items on your to-do list, view wedding inspiration from real couples and much more. Smashing business goals by design. In 2018, Easy Weddings (EW) already had a mobile app but performance-wise it was wasn’t living up to founder Matt Butterworth’s expectations. He approached DreamWalk with a desire to improve a number engagement, retention and conversion metrics. 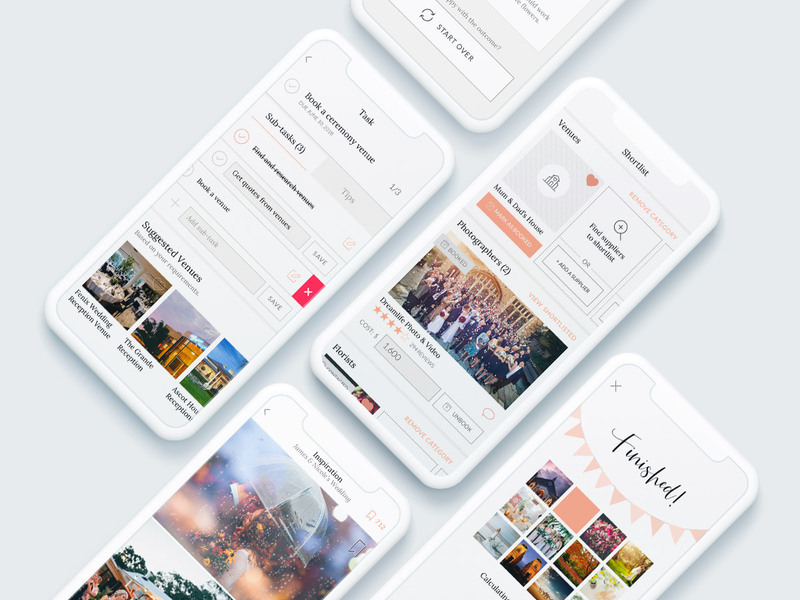 So, after extensive user research and workshopping with the client, DreamWalk got to work redesigning the Easy Weddings app from the ground up. The design draws inspiration from wedding stationary, in clean black and white with peach highlights, extensive use of real wedding photography and quaint illustrations. It aims to make planning a wedding simple and fun and also to showcase EW’s wedding supplier partners. Since launch in mid February 2019, the all new Easy Weddings app has already achieved dramatic lifts in engagement, retention and conversion. The DreamWalk / Easy Weddings partnership is ongoing and the successes so far is just the tip of the iceberg. Let’s chat about how we can help bring your idea to life using our proven formula for success. We will happily sign a confidentiality agreement before discussing.